Are you looking for a way to turn your outing into a complete evening of entertainment? Kick off your event with a pre-show party in The Executive Perch. 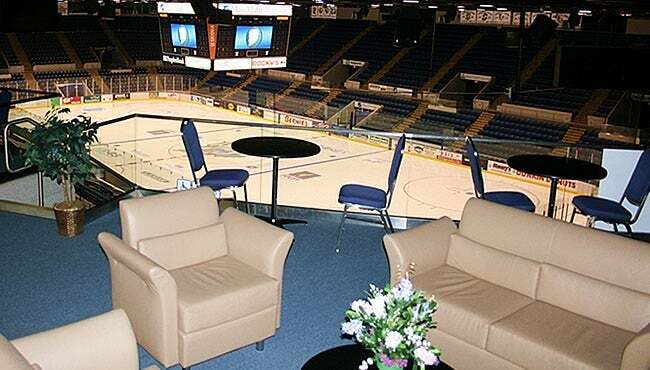 Named for its lofty and highly desired locations, The Executive Perch is the perfect area to watch Springfield Thunderbirds hockey games, sporting events, concerts and family shows. Whether you're looking to entertain clients or host an exciting once-in-a-lifetime birthday bash, we have the perfect up-scale arena location. When your group purchases 25 or more tickets to a specific event and choose from the specially priced Catering Package, you can book The Executive Perch at no additional cost to your party. *Please note that this exclusive opportunity is available for select events only and will be filled on a first come - first serve basis. Please call us at 413.787.6610 to discuss this special opportunity, and let us assist you with all the necessary arrangements to make your evening a memorable one.